Play Romance of the Three Kingdoms 3: Dragon of Destiny Now! Fight to expand your territory and eventually unite all of China. 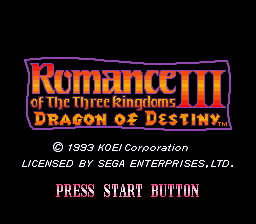 In this edition of the Romance of the Three Kingdoms series, you have the option of Historical mode, or Fictional mode. In Fictional mode the generals are randomly placed and you an create your own characters, while in Historical mode all the leaders are based on historical figures and tied to certain cities. Vast improvements were made over the graphics of RTK 2, as well as slight changes to the interface, commands and tactics. RTK 3 is the only version that includes a strong component of naval warfare. Overall, one of the strongest titles in a truly great progression of classic games.